Synopsis: This program can compare and find similar (duplicates) of musical files (MP3, WMA, ASF, WAV, FLAC, APE, WV). The analysis is made on contents of a file, it is necessary to note that similarity of a sound part is checked, using various algorithms FFT, Wavelet, math statistics, i.e. this is not bit-by-bit comparison, and for that it is necessary for program to decode a musical file. 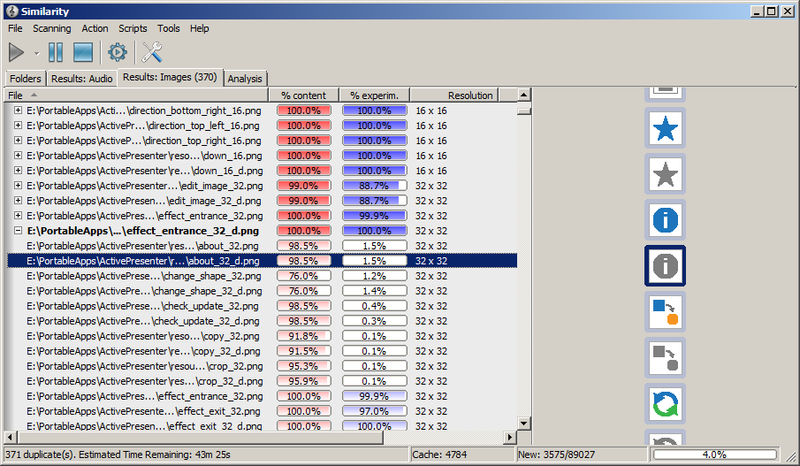 Also the program can compare values of ID3, ASF tags and names of files. Feature of the program is that that it counts up a certain estimation of a file and does not demand constant presence of the carrier with a file, in other words for the analysis it is possible to specify files on time carriers of CD-ROM, DVD-ROM, flash, all of them will equally participate in comparison correctly. At present time the program is in beta-testing, it is given as "freeware". The settings are saved in the registry. You can maintain the settings by importing and exporting this registry key. Last edited by portackager on Fri Nov 07, 2008 12:56 pm, edited 2 times in total. How to extract: Download the installer and install to the default folder. Copy all files (except unins000.exe and unins000.dat to a folder of your choice. Finally, uninstall the application. Launch the program by double-clicking on NetSetMan.exe. You caught me right before my edit. It writes only to the registry, other stuff such as "cache.dat" is written where the application executable is located. I'm confused where did you come up with that he (or I) listen to said rapper? that said I HIGHLY AGREE HA! This program was updated a few days ago and it seemed like time to retry. It runs a little slow in it's initial analysis but I don't expect that's something that can be fixed - it just takes time to analyze and compare. The adjustable similarity values is really cool and has a lot of possible applications for finding duplications in both audio and images. Status: Not portable. Writes to: C:\Users\USERNAME\AppData\Roaming ... moved to Not Portable subforum. License: Freemium. Not super clear on the comparison percentages being underneath the pro version status, but I wouldn't describe this as a demo. Similarity latest release is v2.4.0(?) (available changelogs up to v2.3.1 archived at http://www.similarityapp.com/forum/index.php?board=1.0).